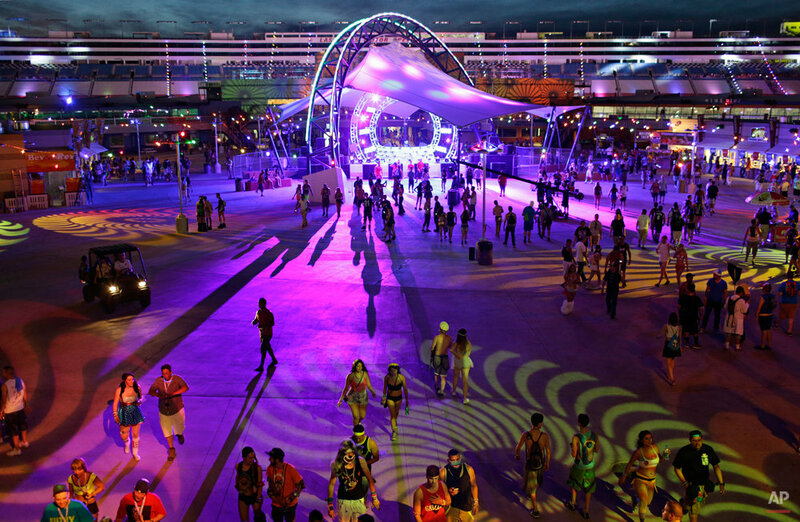 More than 130,000 people poured through the gates of the Las Vegas Motor Speedway each night of the weekend-long Electric Daisy Carnival, a dazzling, multi-sensory ode to electronic dance music. But tragedy also marked the festival. Montgomery Tsang of San Leandro, California, who was attending the event, died Saturday morning after being taken to the hospital. The cause of death for the 24-year-old was pending toxicology and other tests, the Clark County coroner's office said. Event producer Insomniac issued a statement saying it was "deeply saddened" by the death and hoped attendees would do their part to keep the gathering safe. Throughout the weekend, seven stages featured some of the biggest names in the music genre, including Avicii, Diplo, Afrojack and Tiesto, while fireworks arced over the racetrack, Ferris wheels shuttled riders high into the warm desert sky and whimsical, lifelike animatronic sculptures glowed. But organizers like to call attendees the real "headliners" of the show. Flocking from every state and some 40 different countries, fans don bikinis, fuzzy boots, daisy crowns and body paint for a dance party that starts at sundown and ends at sunrise. Dozens of couples married on the carnival grounds, promising "till death do us part" before a minister dressed as Elvis. Hundreds of others exchanged vows with significant others or groups of friends in non-binding commitment ceremonies. Electric Daisy Carnival moved to Las Vegas four years ago from the Los Angeles Memorial Coliseum after the 2010 death of a 15-year-old attendee who was treated for drug intoxication. The festival has encountered less controversy since moving across state lines and is embraced for the estimated $278 million it pumps into the Las Vegas-area economy each year. But arrests and medical problems abound. Between Friday evening and Sunday morning, Las Vegas police reported 560 mostly minor medical calls, with 17 resulting in trips to the hospital. They also reported 48 drug-related felony arrests. About AP Images: AP Images is the world’s largest collection of historical and contemporary photos. AP Images provides instant access to AP’s iconic photos and adds new content every minute of every day from every corner of the world, making it an essential source of photos and graphics for professional image buyers and commercial customers. Whether your needs are for editorial, commercial, or personal use, AP Images has the content and the expert sales team to fulfill your image requirements. Visit apimages.com to learn more.